I’m writing learning-notes from implementing a “toxic comment” detector using a convolutional neural network (CNN). This is a common project across the interwebs, however, the articles I’ve seen on the matter leave a few bits out. So, I’m attempting to augment public knowledge–not write a comprehensive tutorial. A common omission is what the data look like as they travel through pre-processing. I’ll try to show how the data look before falling into the neural-net black-hole. However, I’ll stop short before reviewing the CNN setup, as this is explained much better elsewhere. Though, I’ve put all the original code, relevant project links, tutorial links, and other resources towards the bottom. The above code includes several packages which would need to be downloaded. The easiest way is to use pip. The above variables define the preprocessing actions and the neural-network. Probably doesn’t need much more for the network to discern it’s a toxic comment. Also, if we create the network based around the longest comment, it will become unnecessarily large and slow. Much like the human brain (See Overchoice), we need to provide as little information as needed to make a good decision. This variable is the maximum number of words to include–or, vocabulary size. Regardless, it seems to help us justify keeping the NN nimble. In my code, I’ve used gensim to download pre-trained word embeddings. But beware, not all pre-trained embeddings have the same number of dimensions. This variables defines the size of the embeddings used. Please note, if you use embeddings other than glove-wiki-gigaword-300 you will need to change this variable to match. A helper function in Keras will split our data into a test and validation. This percentage represents how much of the data to hold back for validation. The info object is a list of gensim embeddings available. You can use any of the listed embeddings in the format api.load('name-of-desired-embedding'). One nice feature of gensim’s api.load is it will automatically download the embeddings from the Internet and load them into Python. Of course, once they’ve been downloaded, gensim will load the local copy. This makes it easy to experiment with different embedding layers. The two dictionaries index2word and word2idx are key to embeddings. The word2idx is a dictionary where the keys are the words contained in the embedding and the values are the integers they represent. index2word is a list where the the values are the words and the word’s position in the string represents it’s index in the word2idx. These will be used to turn our comment strings into integer vectors. After this bit of code we should have three objects. embedding_model – Pre-trained relationships between words, which is a matrix 300 x 400,000.
index2word – A dictionary containing key-value pairs, the key being the word as a string and value being the integer representing the word. 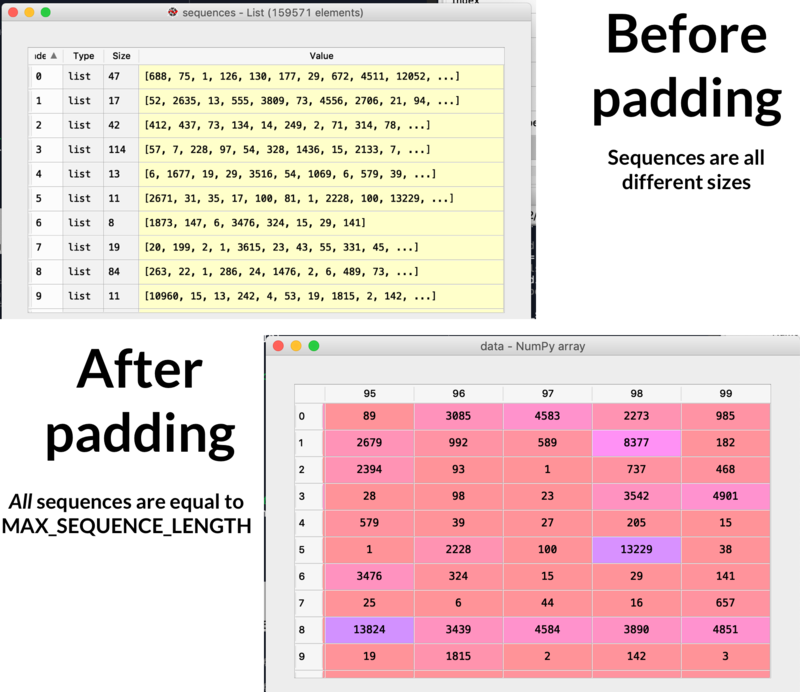 Note, these integers correspond with the index in the embedding_model. word2idx – A list containing all the words. The index corresponds to the word’s position in the word embeddings. Essentially, the reverse of the index2word. This loads the toxic_comment.csv as a Pandas dataframe called toxic_comments. We then grab all of the comment labels using their column names. This becomes a second a numpy matrix called labels. We will use the text in the toxic_comments dataframe to predict the data found in the labels matrix. That is, toxic_comments will be our x_train and labels our y_train. You may notice, the labels are also included in our toxic_comments. But they will not be used, as we will only be taking the comment_text column to become our sequences here in a moment. The Tokenizer object comes from the Keras API. It takes chunks of texts cleans them and then converts them to unique integer values. The num_words argument tells the Tokenizer to only preserve the word frequencies higher than this threshold. This makes it necessary to run the fit() on the targeted texts before using the Tokenizer. The fit function will determine the number of occurrences each word has throughout all the texts provided, then, it will order these by frequency. This frequency rank can be found in the tokenizer.word_index property. For example, looking at the dictionary below, if num_words = 7 all words after “i” would be excluded. Also, as we are loading the data, we are filling any missing values with a dummy token (i.e., “<DT>”). This probably isn’t the best way to handle missing values, however, given the amount of data, it’s probably best to try and train the network using this method. Then, come back and handle na values more strategically. Diminishing returns and all that. This is an easy one. It pads our sequences so they are all the same length. The pad_sequences function is part of the Keras library. A couple of important arguments have default values: padding and truncating. padding: String, ‘pre’ or ‘post’: pad either before or after each sequence. truncating: String, ‘pre’ or ‘post’: remove values from sequences larger than maxlen, either at the beginning or at the end of the sequences. Both arguments default to pre. Lastly, the maxlen argument controls where padding and truncation happen. And we are setting it with our MAX_SEQUENCE_LENGTH variable. Here’s where stuff gets good. The code above will take all the words from our tokenizer, look up the word-embedding (vector) for each word, then add this to the embedding matrix. The embedding_matrix will be converted into a keras.layer.Embeddings object. I think of an Embedding layer as a transformation tool sitting at the top of our neural-network. It takes the integer representing a word and outputs its word-embedding vector. It then passes the vector into the neural-network. Simples! Probably best to visually walk through what’s going on. But first, let’s talk about the code before the for-loop. This gets the maximum number of words to be addeded in our embedding layer. If it is less than our “average English speaker’s vocabulary”–20,000–we’ll use all of the words found in our tokenizer. Otherwise, the for-loop will stop after num_words is met. And remember, the tokenizer has kept the words in order of their frequency–so, the words which are lost aren’t as critical. This initializes our embedding_matrix, which is a numpy object with all values set to zero. 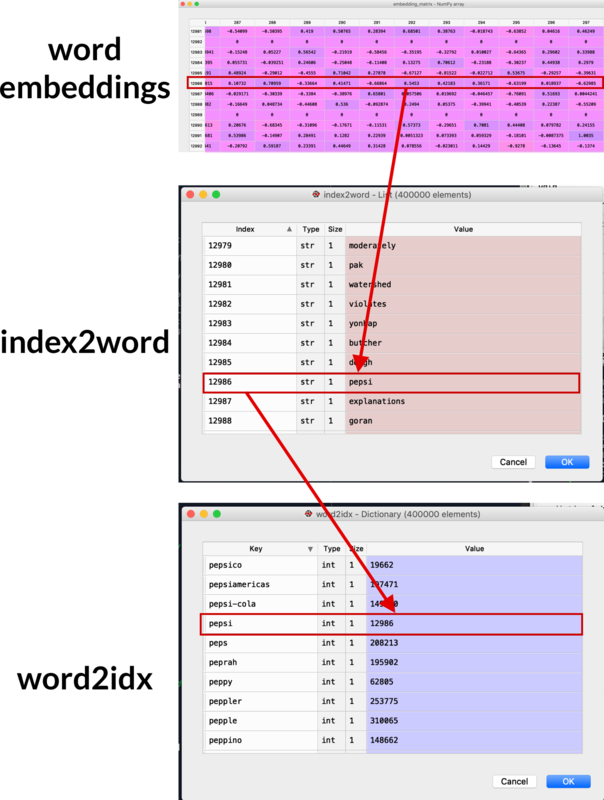 Note, if the EMBEDDING_DIM size does not match the size of the word-embeddings loaded, the code will execute, but you will get a bad embedding matrix. Further, you might not notice until your network isn’t training. I mean, not that this happened to me–I’m just guessing it could happen to someone. Here’s where the magic happens. The for-loop iterates over the words in the tokenizer object word_index. It attempts to find the word in word-embeddings, and if it does, it adds the vector to the embedding matrix at a row respective to its index in the word_index object. Confused? Me too. Let’s visualize it. Let’s walk through the code with a word in mind: “of”. By now the for-loop is two words in. The words “the” and “to” have already been added. Therefore, for this iteration word = ‘of’ and i = 2. This list is contained in a numpy.array object. Lastly, the word-embedding vector representing “of” gets added to the third row of the embedding matrix (the matrix index starts at 0). Also, for a deep visualization, check the image above. The picture labeled “word embeddings” is actually the output of our embedding_matrix. The big difference? The word vectors in the gensim embedding_model which are not found anywhere in our corpus (all the text contained in the toxic_comments column) have been replaced with all zeroes. Here we are creating the first layer of our NN. The primary parameter passed into the Keras Embedding class is the embedding_matrix, which we created above. However, there are several other attributes of the embedding_layer we must define. Keep in mind our embedding_layer will take an integer representing a word as input and output a vector, which is the word-embedding. First, the embedding_layers needs to know the input dimensions. The input dimension is the number of words we are considering for this training session. This can be found by taking the length of our word2idx object. So, the len(word2idx) returns the total number of words to consider. One note on the layer’s input, there are two “input” arguments for keras.layers.Embedding class initializer, which can be confusing. They are input and input_length. The input is the number of possible values provided to the layer. The input_length is how many values will be passed in a sequence. int > 0. Size of the vocabulary, i.e. maximum integer index + 1. Length of input sequences, when it is constant. This argument is required if you are going to connect Flatten then Dense layers upstream (without it, the shape of the dense outputs cannot be computed). In our case, the input will be the vocabulary size and input_length is the number of words in a sequence, which should be MAX_SEQUENCE_LENGTH. This is also why we padded comments shorter than MAX_SEQUENCE_LENGTH, as the embedding layer will expect a consistent size. Next, the embedding_layers needs to know the dimensions of the output. The output is going to be a word-embedding vector, which should be the same size as the word embeddings loaded from the gensim library. We defined this size with the EMBEDDING_DIM variable. Lastly, the training option is set to False so the word-embedding relationships are not updated as we train our toxic_comment detector. You could set it to True, but come on, let’s be honest, are we going to be doing better than Google? Here we are forming our data as inputs. We convert the data into x_train and x_val. The labels dataframe becomes y_train and y_val. And here marks the end of pre-processing. Load the word-embeddings. These are pre-trained word relationships. It is a matrix 300 x 400,000. Get our toxic_comment and labels data. Convert the comments column from toxic_comments dataframe into the sequences list. Pad all the sequences so they are the same size. Look up the word-embedding vector for each unique word in sequences. Store the word-embedding vector in thembedding_matrix. If the word is not found in the embeddings, then leave the index all zeroes. Also, limit the embedding-matrix to the 20,000 most used words. Split the data for training and validation. And that’s it. The the prepared embedding_layer will become the first layer in the network. Like I stated at the beginning, I’m not going to review training the network, as there are many better explanations–and I’ll link them in the Appendix. However, for those interested, here’s the rest of the code. Oh! There’s one more bit I’d like to go over, which most other articles have left out. Prediction. I mean, training a CNN is fun and all, but how does one use it? Essentially, it comes down to repeating the steps above, but with with less data. # Convert the sequence to tokens and pad it. Put your test sentence here. The pre-trained model. This is the Keras model we just trained. A sequence you’d like to determine whether it is “toxic”. The tokenizer, which is used to encode the prediction sequence the same way as the training sequences. Really, the function takes all the important parts of our pre-processing and reuses them on the prediction sequence. One piece of the function you might tweak is the .round(0). I’ve put this there to convert the predictions into binary. That is, if prediction for a sequence is .78 it is rounded up to 1. This is do to the binary nature of the prediction. Either a comment is toxic or it is not. Either 0 or 1. Well, that’s what I got. Thanks for sticking it out. Let me know if you have any questions. If you want to know more about gensim and how it can be used with Keras. The data are hosted by Kaggle. Please note, you will have to sign-up for a Kaggle account.